These straws are made of stainless steel,pls cooling the hot water or coffee for a while before sipping. Adult supervision is required when used by children under 5 years old. What you will get: Set of 8pcs extra long stainless straws (4 bent + 4 straight + 2 cleaning brushes),total length of 10.5inch. Material: Made of 304 stainless steel, food grade material and BPF free, and won't rust, corrode, stain or bend. The mouth of straw undergoes several steps of procedure from scratching injury to ensure your safety. Pls note the hot water or coffee when you sipping. 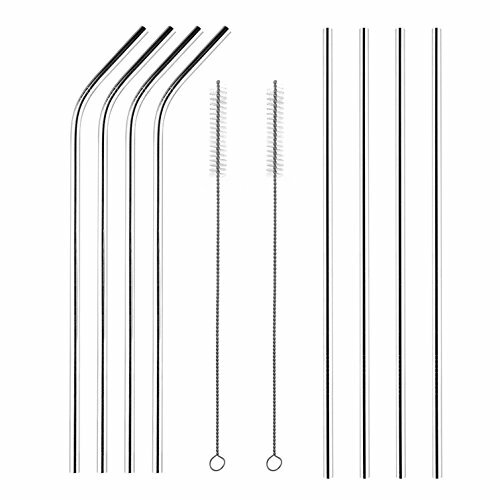 Application: Modern and sleek stainless straws add fun to any party, trendy for family reunion,girl's night out,cocktail party,Patio BBQ,picnics,boating and more! EASY TO CLEAN: 2 cleaning brushes which is long enough to inside of straws, of course the straws can be washed in the dishwasher to save your labor. Guarantee: Your complete satisfaction is our largest destination. Any unsatisfied, just contact to us. We will offer refund or replacement for you. If you have any questions about this product by Betoores, contact us by completing and submitting the form below. If you are looking for a specif part number, please include it with your message.